Award winning TV viewing technology! Reveal nuances in hue and shading! Bring out the best in Plasma, LCD, and OLED displays! Prolong the life of your TV! Color correct for all color television standards! Suitable for radiology monitor environments! WHICH IDEAL-LUME IS RIGHT FOR ME? The Ideal-Lume Standard fluorescent model is for TVs and monitors that are not mounted on a wall. A single light has proven sufficient for TVs as large as 73" diagonal, if the wall color behind it is white or very nearly white. Darker wall colors may require a second light, especially larger sized TVs. Comes in either 110V/60Hz or 220V/50Hz versions. The NEW IDEAL-LUME STANDARD LED model is a lower cost option. It is linkable, so it can be used for a single display on a stand, or additional units can be used for wall mounted flat-panel TVs and monitors. It is electrically dimmable, with a plug-in dimming control included (dimmer is rated only for 60Hz electrical systems). 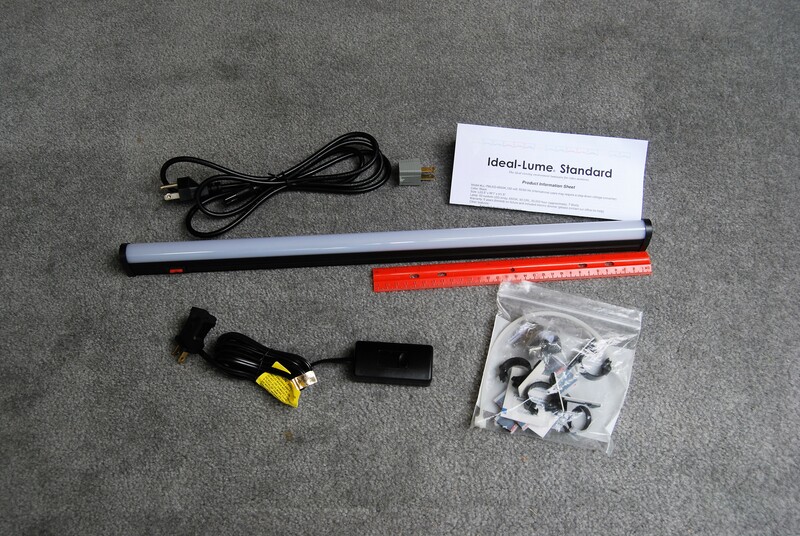 The Ideal-Lume Panelight fluorescent model is for wall mounted flat panel TVs. Such TVs are so close to the wall that not enough space is provided for unobstructed distribution of the illumination on the wall behind and around the screen. More than the included two light fixtures may be necessary for wall mounted panels that are 60 inches diagonal or more. Additional lights may also be required for unusually dark wall colors. This product uses the same fixture and lamp as the Standard model. Comes in either 110V/60Hz or 220V/50Hz versions. The NEW IDEAL-LUME PANELIGHT LED model is for wall mounted flat panel TVs. Such TVs are so close to the wall that not enough space is provided for unobstructed distribution of the illumination on the wall behind and around the screen. More than the included two light fixtures may be necessary for wall mounted panels that are 60 inches diagonal or more. Additional lights may also be required for unusually dark wall colors. This product uses the same fixture as the Standard LED model. It is electrically dimmable, with a plug-in dimming control included (dimmer is rated only for 60Hz electrical systems). Only one power cord and a single one-meter linking cable are included. The NEW IDEAL-LUME PRO LED is suitable for ultimate color accuracy in technically correct viewing environment conditions. The wall color behind the monitor should be truly neutral (white to gray). This model has become a reference standard solution for video professionals world wide. It is now linkable and electrically dimmable, with a plug-in dimming control included (dimmer is rated only for 60Hz electrical systems). Please call or e-mail our office if additional application help is needed. Extra LED fixtures and LED light linking cables are available. Please see our store. Our professional version of Ideal-Lume LED answers the need for more demanding performance criteria in a viewing environment luminaire. The heart of this model is the most accurate CIE D65 LED lamp available. We use custom LEDs designed the USA. It has the best Spectral Power Distribution (SPD) of any LED of this type in the world. The Ideal-Lume Pro LED has a new, slimmer, extruded aluminum fixture body. It is now linkable, with optional linking cables, and dimmable, with an electric, plug-in dimmer included. Ideal-Lume Pro has been selected for use by: The Metropolitan Museum of Art; Electronic Arts; THX, Ltd.; Joe Kane Productions; Universal Studios; The Imaging Science Foundation; The National Institute of Standards and Technology; Technicolor; Deluxe; Dolby Labs; Walt Disney Animation, Dreamworks Animation; discriminating video professionals and videophiles around the world. Price Includes one spare lamp! Our standard consumer Ideal-Lume was the original model we developed. Since Mr. Joe Kane, of Joe Kane Productions, began writing about the findings of SMPTE’s Professional/Studio Monitor Working Groups (which he chaired), the need for 6500 Kelvins lighting in a video viewing environment became known to consumers. Others have written in the years since about proper monitor backlighting and the benefits of "biasing" the iris for extended viewing of electronic displays. Prior to Ideal-Lume, readers were only instructed to assemble the proper components on their own. 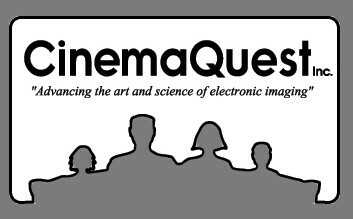 CinemaQuest, Inc.’s founder and president experienced considerable difficulty in locating accurate, quality components over several years as a home theater hobbyist. His affinity with the average videophile/home theater hobbyist inspired him to develop and market a pre-assembled video bias light that was simple, accurate and affordable. Our standard Ideal-lume provides a ready solution, at a reasonable price, for discriminating hobbyists and TV viewers to enjoy critical benefits of "the ideal viewing environment" in their homes. The T5 lamp used in this model is custom made for us and has excellent color performance in a smaller size. It’s three-phosphor mix is specifically formulated for color accuracy. With a Color Rendering Index (CRI) of 90 out of 100 and excellent Spectral Power Distribution (SPD) this lamp offers superior color rendition over typical fluorescents. Industries that rely on accurate daylight color recognition when comparing physical color samples recommend ambient lighting with a minimum CRI of 90. 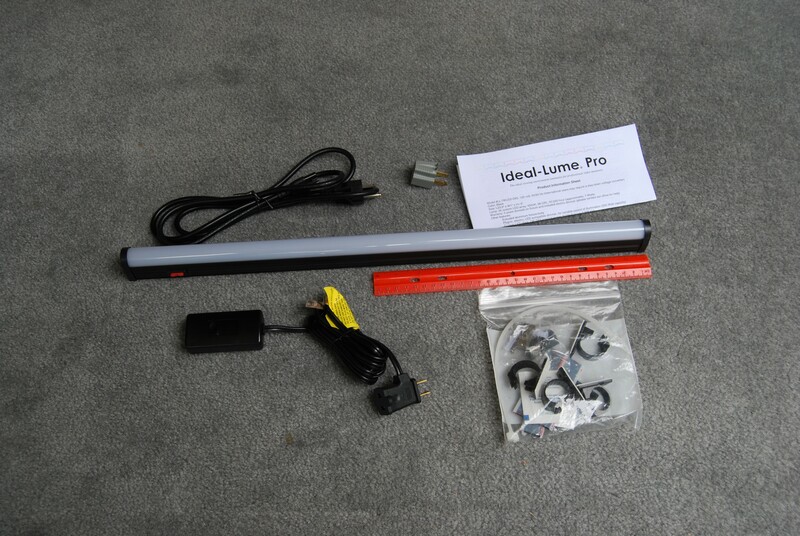 Our newest version of Ideal-Lume standard uses a custom made T5 fluorescent fixture that is extremely slender and light weight. It uses an electronic ballast for instant start, quiet, and efficient operation. The on/off toggle switch is mounted on the side. This fixture provides some unique, multi-gang, interconnectivity options. Up to 10 units can be connected end-to-end with a small adapter included with each unit. Optional 1 meter linking cables can be ordered from our store that allow for more distant spacing of the fixtures. Each fixture must be switched individually when ganged together. Industrial strength, high temperature, self-stick Velcro fasteners are provided with each unit. We also include screws and drywall anchors for additional mounting options. Comes in either 110V/60Hz or 220V/50Hz versions. This dual fixture model is specifically configured for use behind wall-mounted, flat-panel TVs. These types of displays tend to be very bright in a darkened viewing environment, increasing the likelihood of eye strain during critical viewing sessions. 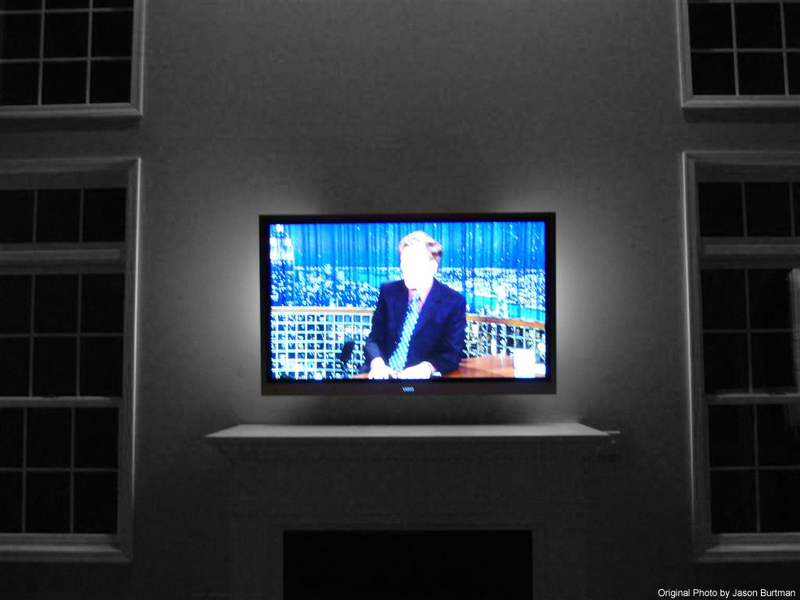 The flat, reflective, glass screens used for gas plasma and LCD displays can produce considerable glare in a room using conventional room lighting. Placing the light source behind the panel does wonders for eliminating the annoying reflections that distract from, and even obscure, the image on the screen. We use a custom made T5 lamp for its excellent color accuracy and smaller diameter. It has a high-frequency electronic ballast for quiet, efficient operation and instant startup. A simplified, permanent, mechanical baffle tube is included with both lights to regulate the light output and control its dispersion. 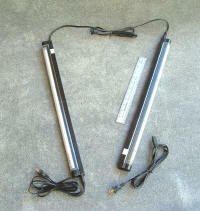 Two products can be ordered for illuminating all four sides of a panel. This can be more aesthetically pleasing in appearance and is especially suitable for very large TVs. Additional linking cables might need to be ordered from our store to allow all four lights to be interconnected. A small joining adapter is also included with each fixture. This allows end-to-end coupling of multiple fixtures when more light is desired. Up to ten fixtures can be joined using either or both methods. This model can be attached directly to the back surface of a flat panel TV. Industrial grade, high temperature adhesive is used on the self-stick Velcro included with the product. Screws and drywall anchors are also supplied to allow other mounting methods. Check the dimensions of Ideal-Lume Panelight carefully against the space available behind any flat TV. It may not fit behind some panels that use very low-profile mounts. In this instance the TV’s mounting bracket may require shimming to allow enough space for the fixtures. The fixture should not be visible directly from any viewing position. 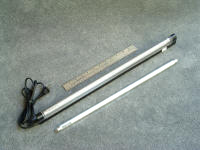 Each fixture’s dimensions are: L 22 1/2" x W 1" x H 1 3/4". It may be difficult to reach the toggle switches after installation. Our online store offers various accessories that provide automated switching of our lights. Comes in either 110V/60Hz or 220V/50Hz versions.